Those of you who keep kosher likely know Susie Fishbein's series of kosher cookbooks, the first being Kosher by Design. This February, Susie is coming out with another book: Passover by Design. Even those of you who don't keep kosher may want to add this book to your library for its modern seder settings and unique recipes. Recipes include Thai quinoa (a berry that has the taste and texture of a grain) and giant zebra fudge cookies (zebra stripes are so in right now). 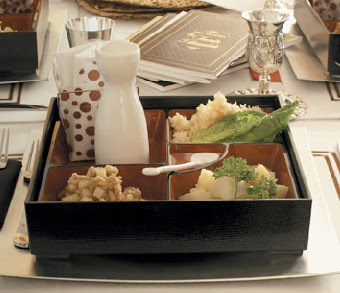 And check out this table setting which includes individual seder boxes complete with all the necessities for seder participants. No more reaching across the table for the matza or maror -- you've got your own stash in front of you. The box even has a sake flask and tea towel for the ritual handwashing. Passover by Design is scheduled for release on February 28th. You can reserve your copy at ModernTribe.com for 20% off the cover price and we'll ship it to you as soon as it arrives. You can see more of a preview of the book here. Thanks for the clever and modern ideas Susie!